Introduction: (Complete version of journal article is attached here). In 2015, the United States was the second largest producer of tomatoes in the world. The U.S. produces tomato for fresh and processed markets respectively, and both markets contribute over $2 billion in annual farm cash receipts. In the state of Georgia, tomato is one of the most important commercial crops and ranks amongst the top ten vegetables in terms of farm gate value. For instance, from 2009 to 2014, tomato contributed over $265 million to the state economy. Tomato yellow leaf curl virus (TYLCV), transmitted by whiteflies, are a major threat to tomato production around the world. The spread of the virus in the field and in glass houses is directly correlated to increase in whitefly population. The virus was first seen in Israel in 1950. Almost 50 years later, the virus was seen in Florida, Georgia, the Carolinas, Texas and California. Infected plants show symptoms of stunting, flower abortion, curling of leaflet margins, yellowing of young leaves, inferior overall cosmetic appearance of fruits quality and decreased yields. It is common to experience yield losses of up to 100% in affected fields. Also there is no official estimate of losses caused by this virus but it is assumed to be in the tens of millions of dollars. Although several studies discussed the economic evaluation for preventing tomato with respect to pesticide use, exclusion screen, intercrop and cultivars, there are limited studies that provide economic analyses of TYLCV prevention and management options. As a result, the objective of this study was to develop an economic productivity and profitability analysis aimed at determining the financial and economic viability, if any, of managing TYLCV. This experiment was conducted at the Horticulture Farm, Coastal Plains Research Station, University of Georgia, Tifton, during the summers of 2013-2015. We specifically evaluated the use of TYLCV-resistant cultivars, metallic silver mulch, and the use of the insecticides relative to white mulch, a TYLCV-susceptible tomato, and a no insecticide check, respectively. The experimental response variables measured were whitefly adult, immature and egg incidence, TYLCV symptom severity, and marketable yield. Tomato cultivars used included Shanty, Security, Tygress and the susceptible cultivar FL-47. The types of mulch used were reflective and a standard non-reflective white mulch. Insecticides used were cyantraniliprole, applied at 13.5 fl. oz. per acre, imidacloprid at 10.5 fl. oz. per acre and water as a control. Each treatment was replicated 4 times. The inputs used in the economic analysis of insecticides for the management of whitefly- transmitted TYLCV in tomato production were slightly different from the conventional tomato production practices. For instance, the planting materials were TYLCV-resistant lines plants, which cost $466/ac. Silver mulch was $513/ac while insecticide used to control white flies was $159/ac. The combined fertilizer cost was $692/ac. Fumigation, fungicides and labor costs were $570, $189 and $550/ac respectively. Total pre-harvest variable cost (P-H VC) was $4,200/ac. A sensitivity analysis based on total cost of production showed that an expected net return of producing tomatoes in the presence of TYLCV was $1,958/ac and obtainable 50% of the time. The result further showed that $-887 may be obtained 7% of the time in a worst case scenario while a rare net return of $4,802 is also realizable 7% of the time. These results reconfirm the importance of good agricultural practices and adherence to management recommendations from research and extension scientists in successfully managing whitefly-transmitted TYLCV (Table 1). Table 1: Sensitivity Net Return of producing tomatoes in the presence of whitefly-transmitted tomato yellow leaf curl virus (TYLCV) in the Southeast USA, 2017. The chances of obtaining this level or less (BOTTOM ROW). Acknowledgment: We acknowledge the technical help rendered by Mr. Simmy Meckeown, and numerous student workers at the vector biology laboratory, UGA, Tifton, during the course of this study. This project was partially funded by USDA AFRI Grant 2012-67007-19870 for which the authors are grateful. Last week in Atlanta Extension economists, lenders, and ag media met in Atlanta to discuss the market and policy outlook for agricultural commodities in the Southeast in the coming year. 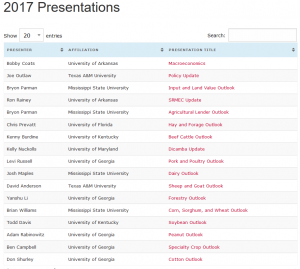 UGA economists presented the outlook for peanuts, timber, turfgrass, the green industry, cotton, poultry, and hogs. All presentations are available here. Feel free to contact us with questions about the presentations. Posted in Beef Cattle, Cotton, Dairy, Horticulture, Marketing, Peanuts, Policy, Poultry, Row Crops, Turfgrass.